Each year, on a Sunday close to St George’s Day, new Queen’s Scouts gather at Windsor from across the United Kingdom and sometimes beyond. In the morning many Scout Leaders attend Mattins (a service open to all) in St George’s Chapel whilst the new Queen’s Scouts are gathering together elsewhere in Windsor. In the afternoon a parade is held; the salute is often taken by a Member of the Royal Family and this year those on parade will be honoured by the presence of Her Majesty The Queen. 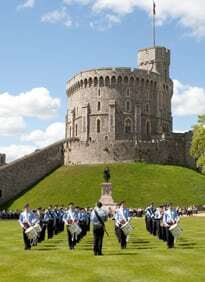 Later in the afternoon the parade marches through the Castle to St George’s Chapel for the National Scouts Service. This service is prepared by Scouts; this year the theme is Beyond the Crossroads. During the course of the Service the Chief Scout (Bear Grylls) will lead the renewal of the Scout promise; he will also address all present from the West steps of the Chapel after the Service. Scouts have been coming to St George’s for over 80 years. 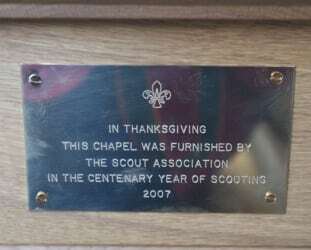 Some new furniture was given to St George’s to mark the Scouts centenary in 2007 for use in the Rutland Chantry. 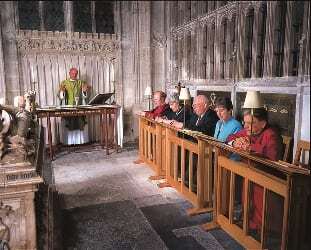 The chantry chapel, on the north side of St George’s Chapel, is used about twice a week for services of Holy Communion and a small brass plaque mounted on the furniture explains the gift. A book containing the names of subscribers for the furniture is held at Scout HQ (Gilwell Park). A small wooden crucifix has been on the altar in the Rutland Chantry for many years, long before the gift of the furniture was even an idea. 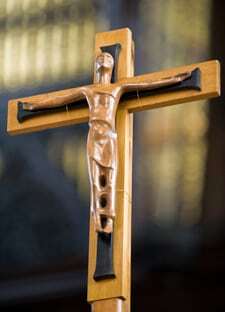 The sculptor, Don Potter, was involved in the very early days of the Scouting movement which therefore provides a very fitting coincidence of furniture and crucifix.